And that’s it..I am wondering why I did not do this before. Not even sure if this was available in previous versions of Safari or not. I know most browsers let you change the User Agent but was not sure if iPad Safari could be simulated too. Just before publishing this post, I thought I should check whether this feature is available in other browsers. It is available in Google Chrome, as well. 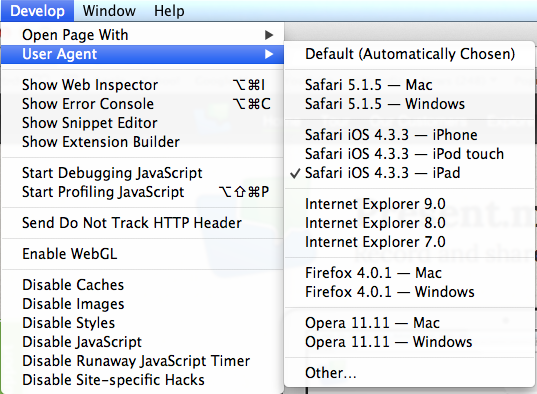 You can change the user agent in Google Chrome too. Its also avaliable in android browser which is chrome based. To expose this feature you need to type about:debug in the browser and when you see menu you will get more feature and one of them lets you change that. In Android Phone/Tablet or on PC? How do you get safari to be on an iPad desktop or home page without having to search something in your search box?